To those of you who have been following along since the first Wisdom from the (Recent) Past post, welcome back! To those of you just jumping in, welcome (check out the rest of the series linked at the bottom of this post)! 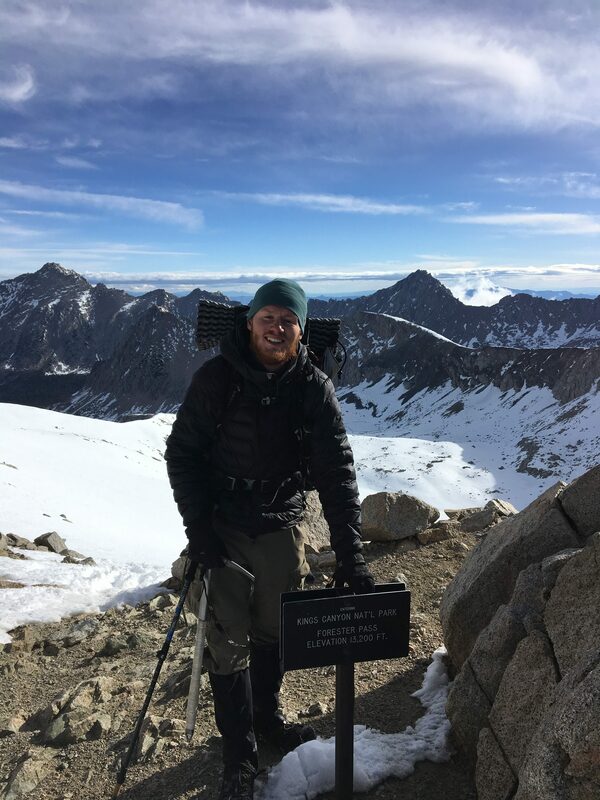 We’re back chatting with 2018 PCT thru-hikers again about solo hiking, trail inspiration, and more. *Actual finish date was 9/2/18 (a fire closure stopped me at Hart’s Pass 30 miles from the border; I went back two weeks later on the first day the fire closure reopened to tag the border). Stehekin. It felt the most like a trail environment and like it was set up for hikers. I ended up taking the boat to Stehekin from Holden Village due to a fire; as soon as we arrived in town we were taken to the bakery, given information about permits, and given information about the shuttle back to the trail. To prepare I started by going on a couple of section hikes on rough Washington sections at a typical thru daily mileage to prepare myself for trail life and for the physical toll it would take. At the end of an eight-day section I knew I wanted to do the whole trail. As my start date came closer I was going for 20-mile walks with a weighted pack at least once per week. I think that completing section hikes prepared me the most mentally and the 20-mile walks prepared me physically. I think that they both directly affected the outcome. Knife. I used it twice over the whole hike. I have a more thorough desire to live simply and find a way to live in a small town in the middle of nowhere. I didn’t really have a trail family. I hiked with certain people that I got along with for various periods of time. I partnered up with Viking for a our early May trip through the Sierra when no one else was around and I hiked with BooBoo Boy in Washington because he needed some resupply help and I had friends and family taking care of me in Washington. The miles seems to go by quicker when talking and it was always nice to have friends to do stuff with when stopping at a trail town. I get to fully take in the environment that I am in when alone; I look around more and stop more frequently to take photos. Thinking about work; I constantly reminded myself that if I quit I would have to go back real life. Freedom and lack of responsibility. Prepare yourself physically, mentally, and financially before beginning your hike and try to be aware of what typically takes hikes off trail to prepare for those obstacles. Many of the hikers that I met who eventually left the trail didn’t prepare themselves for the reality of what they faced; they went in optimistic that they wouldn’t encounter any of the obstacles instead of making a plan to take them on. Stop: Burney Mountain Guest Ranch. Linda was an amazing host who provided delicious meals and a wonderful place to relax, but the highlight of the stop was connecting with the hikers I met there, many of whom I leapfrogged for much of Northern California and Oregon. I had hiked mostly solo for nearly 1,000 miles prior—making friends along the way, but never hiking with someone for more than a day or two at most. I also reunited with Frick from my first trail family, and hiked with him and Max between Burney and Shasta before climbing Mount Shasta with Open Toe and Hot Dog. I would highly recommend shipping a box and spending at least a night at Burney Mountain Guest Ranch for anyone hiking the PCT. Town: Ashland. As a small city rather than a rural town, Ashland wasn’t the most convenient to navigate as a hiker. However, they also offered the amenities of a city—a diverse range of restaurants rather than just your typical mom-and-pop burger stand, entertainment options like the Shakespeare Festival, and most importantly for me, an urgent care facility. The Ashland Shop’n Kart was probably the best resupply stop all trail long. They offered an incredible selection of chips, bars, and best of all—bulk foods—all at reasonable prices. Fitness-wise, I lived an active lifestyle between playing soccer and hitting the gym regularly. A month before the trail started, I finished my first ever 10k much faster than I would have expected otherwise, which strengthened my confidence going into the trail. In addition I constantly researched gear options to ensure that my kit was dialed in. I wanted to carry exactly what I needed to be comfortable and nothing more. My extremities get cold due to poor circulation, so I carried down booties and gloves with me through the entire PCT. I also carried a small compact camera—the RX100 III—to capture memories of my trip through photography. For entertainment, I kept audiobooks and podcasts on my phone. I started with a set of cooking gear, but I realized that I didn’t get much value out of cooking each night. After the Sierra, I sent my cook kit home in favor of no-cook for the rest of the trail. By the end of the trail, I dropped a fair amount of small gear: most of my FAK, lots of water capacity, extra shirt, rain mitts, and my groundsheet. With the benefit of hindsight, I wish I splurged out for a Katabatic Palisade or Nunatak Arc 20 quilt rather than Underground Quilts. I love my UGQ Bandit, but it’s too drafty to use when paired with a CCF pad; however, with pad straps and an XLite it’s fantastic. Unlike many I wouldn’t consider my time on the trail “life-changing” per se, but that doesn’t take away from the impact it did have. I’m stronger and can persevere through more than ever before. I know not to let fear, uncertainty, or doubt keep me from trying new things or pursuing my goals in life. And I have a renewed faith in mankind. Regardless of their background, the people I met on trail—complete strangers for the most part—were almost unfailingly kind and generous beyond compare. I was overwhelmed by the amount of trail magic I received, whether it was water, hitchhikes, food, lodging, or otherwise. Although many may believe in the kindness and benevolence of others, experiencing it firsthand was something else altogether. I split my time between hiking solo and in a group. I separated from my first trail family halfway through the desert, but it turned out to be a blessing in disguise, since I was able to meet and make connections with even more diverse and friendly hikers after I left. A group I met in the Sierra caught up to me shortly after I departed from Shasta City, and we hiked together for most of Oregon and Washington. My first trail family hit the trail running. There was an unspoken goal to hike long and fast, which helped me push past my physical limits early on in the desert. Since the rest of my trail family were all either previous thru-hikers or athletes, I was happy to learn that I could keep up with some of the fastest people at the start of the trail. The trail family I hiked most with was a lot more down-to-earth. We were all happy to enjoy the trail with each other, and when we weren’t chatting about food for the next town over, we would nerd out to ultralight gear, celebrity hikers, etc. We still covered distance quickly, but they helped me enjoy the trail more rather than submitting to the voice in the back of my head whispering “push more, hike faster, be better.” Shout-out to Fievel, Super Soaker, Mugwort, and Hold It! I’m not sure how to qualify it exactly, but I just generally enjoy spending time with others. I always find experiences so much more rewarding when I can share it with friends, and that’s exactly what I had with my trail family. Whether it was settling into camp after an exhausting day, enjoying a break while playing Taboo, or crushing out our 60-mile day, my trail family made my experience on the PCT more pleasant and memorable. Both my favorite and least favorite parts of being alone was getting into my own head. I’ve always been fairly neurotic (in the five-factor model sense), so I overthink everything. Parts of my hike were miserable, but sinking into my lows allowed me to better appreciate the highs. I’m certainly not completely at peace with myself now, but I am much better at working through tough mental places, accepting things as they are, and appreciating the little things. “My day starts at 5 am. I will walk all day at 3 mph, stopping only to get water, dump sand from my shoes or such. Each stop lasts but a few minutes. I walk until the miles pile up, until night falls and my headlamp comes out, until the aching in my feet and legs seems unbearable. The last miles I am stumbling, tripping. Finally, I pitch my tent on whatever surface is available. It may be flat, or not, or rock hard, but it is home for the next few hours. Inside I struggle to choke down a protein shake; my exhaustion overrides my hunger. I peel socks off from blistered swollen feet. I crawl into my sleeping bag and prop my feet on my food bag. Pain, spasms, cramps, sharp cries that shoot along my nerves; my legs and feet make it hard for me to sleep. 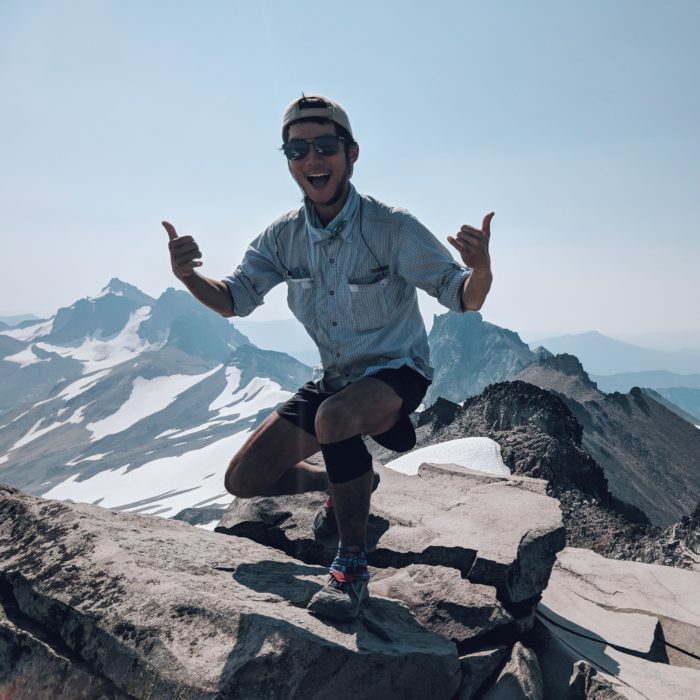 I clench my teeth against the jolts and wait for exhaustion to overcome me again.” Putting myself in the shoes of FKT hikers like Anish and Stringbean made my personal struggles feel trivial by comparison. With dreams of audacious future trips driving me forward, I kept myself together by remembering all the wonderful friends who supported me. I tried to take photos with as many friends as I could before I left Austin for the PCT. When times were tough, they were the foundation that propped me up. If they read this, thank you so much; there’s no way I could have survived without you. I miss how simple life is while thru-hiking. Eat. Hike. Sleep. Repeat. There’s this amazing dichotomy where you’re simultaneously pursuing a monumental goal of completing the thru while walking without purpose necessarily—without needing to plan ahead beyond a couple days of food or some water. Rather than stressing over upcoming deadlines and obligations, you have this meditative experience of making your way north step by steady step. I hope everyone can have their own version of that experience at some point in their lives. Thanks again to these hikers for participating in these interviews. Hopefully, they are providing some insight for those who are still planning (or dreaming) of their hikes. And for other former thru-hikers, may these interviews provide a good dose of trail nostalgia. Gotta get that fix of vicarious thru-hiking while most of the class of 2019 is still prepping for the trail.